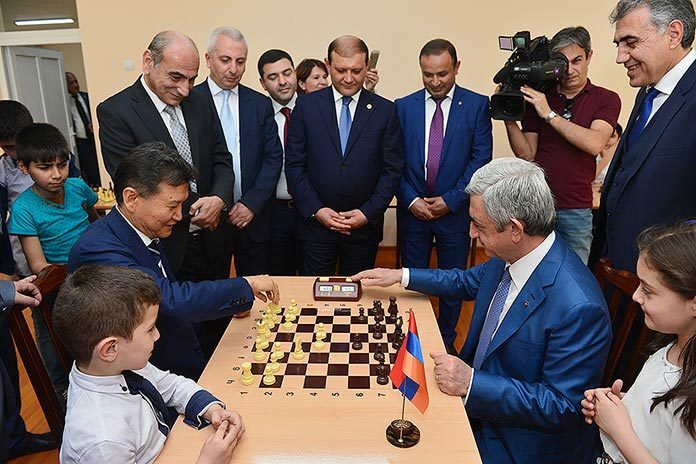 The top chess official made the remarks during the opening ceremony for the World Individual Deaf Chess Championship that took place in Yerevan on May 17, attending the event together with Armenian President Serzh Sargsyan, who is also the head of Armenia’s chess federation. “On May 24, I will be in Azerbaijan meeting with Azerbaijan’s leadership and will offer the following initiative – “country against country”, for Armenia and Azerbaijan to play collective chess when everyone who wishes can take part in the game by making a move on the Internet,” Ilyumzhinov said in an interview with Russia’s Sputnik Armenia news agency. It is remarkable that the 42nd World Chess Olympiad will take place in the Azerbaijani capital of Baku on September 1-14. While in Yerevan, Ilyumzhinov wished to Sargsyan that Armenia win their fourth Olympic medal at the Baku Olympiad. During the inauguration of a chess school in Yerevan’s Shengavit district on Tuesday, Ilyumzhinov played a blitz chess game with President Sargsyan, which ended in a tie. After the game, Ilyumzhinov described Sargsyan as “the champion among heads of all FIDE member states.” The organization led by Ilyumzhinov includes 187 nations.